Usually when I think about flocks, I think of sheep. Wooly, bleating, earth-bound sheep. And with all the time I’ve spent steeping in religious literature and imagery, when I think of sheep, my thoughts quickly turn to the Shepherd. The Shepherd was/is definitely not a sheep. 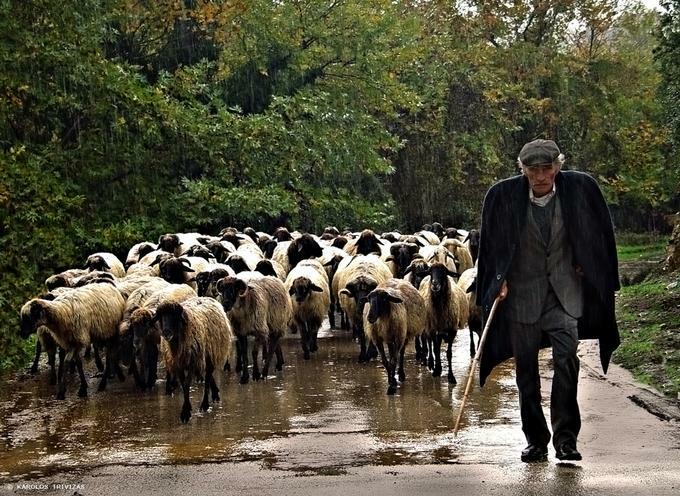 I mean, if we stick with the sheep/shepherd metaphor, where sheep are the people (us) and the Shepherd is Jesus… well, I can’t help but notice that the Shepherd is not merely a sheep with leadership responsibilities. The Shepherd is an entirely different species. On his two legs, the Shepherd leads – and the sheep, on four, follow. The Shepherd discerns and the sheep trust. And, most importantly, the sheep don’t aspire to be like the Shepherd. After all, how could they? No matter how good they are, they will always just be sheep. Now, don’t get me wrong. I think that there are plenty of ways that the traditional “Good Shepherd” image of Jesus works well. Knowing how frequently I have been lost in the darkness of my own doubts, sins and self-loathing, I find it both heartwarming and astounding to think that the Good Shepherd loves me enough to search for me and bring me back into the light. When I am worn out and scraped up from the brambles and thickets that pepper a day’s journey, it is a relief to know that I can look to the Shepherd for direction. And if I lived in an agrarian culture, I’m sure I might find more useful insights via the metaphor. But I don’t. I live in a city. And as a pastor (a title that has its roots in a more agrarian time and place), I need to know that Jesus thinks I really can be more like him – that I am more than just a sheep. I guess, what I’m trying to say is that I need a new metaphor – and this winter I may have found it. This is my first winter in Kansas City, and it has been very different from those Texas and Arkansas winters I had come to know. It is colder. We’ve had a ton of snow. Everything feels grayer and the air has a salty bite to it (as a result of some complex equation involving wind and road salt). But the biggest difference – at least the one that has struck me the most – is the geese. I was aware of geese before moving to KC. I’d seen an occasional flock pass high overhead in Fayetteville, and I touched a few at petting zoos in my childhood. But those experiences pale in comparison with the blustery goose-filled wonderland that is a Kansas City winter. They are simply everywhere. For the past three or four months, a day has not passed that didn’t contain the majestic, fluid “v” of a flock in flight. And the sounds! Oh, the sounds! Harmonious honking precedes each “v” – building in volume until the formation finally comes into view through the trees. And then, there they are! 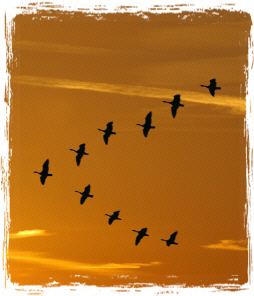 Soaring as they honk, one to another – keeping every member of the flock informed of progress and direction, encouraging and checking in, and, periodically, calling a new leader to the front of the ‘v”. If there is a goose in the flock that leads more than the others, that leader is still a goose. That leader keeps the flock safe and focused with the sound of its voice, while also teaching and encouraging the others to communicate. That leader periodically moves to a different position in the “v” – and trusts one of the followers to lead for a while. And the flock soars! …Jesus in the flock instead of Jesus separate from it. …Jesus honking out encouragement and direction when we need it. …Jesus equipping and trusting us to soar! This week, at least, that metaphor works for me. well, yeah for new metaphors. that’ll fly. so to honk. thanks for sharing. woops…’pasted’ wrong scripture. Intended the following concerning Peter and sheep. I’VE ALWAYS BELIEVED THE FIRST TIME WAS THE FATHER WHO ASKED., SECOND WAS THE SON WHO ASKED. AND THE THIRD WAS THE HOLY SPIRIT WHO ASKED. They are ONE yet they are Three..Trinity. These verses always remind me of the fellowship we have with Father, Son, and Holy Spirit. All three is part of our salvation.